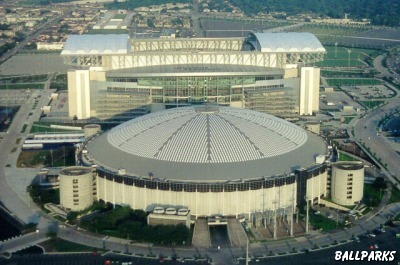 With the failure of Houston's 2012 Olympic bid the future of the Astro-Dome is somewhat in doubt. (They claim it was the first domed stadium in 1963.) There have recently been calls for suggestions for a new use. I suggest that the paint be removed from the roof and lenses attached to the underside creating the worlds largest solar powered barbecue. What did London do with their Millennium Dome? I'd suggest painting it to look like R2D2, and making it a permanent Star Wars convention site. P.S. Is this an idea? who knows? who cares? sold it off for a quid, no doubt. *Massively* cruel to poor, defenseless ants on the grass. No grass in the dome. Just that horrible, demon-created "Astroturf". I'm sure that will smell nice while burning. Hehe, thanks for the great link [ack]! You gotta watch the mpegs! Dismantle the dome, and move it to Vancouver for our (soon-to-be) successful 2010 Winter bid. Wait. We already have a covered stadium. Never mind. Barbeque is a variant of barbecue that's recognised by Merriam-Webster. I'd say that makes it fine. [UB]: I thought Starbecue is what you got after the local pyromaniac set fire to the upper-crust coffee joint. Holy smokes! egbert's right. I never used a dictionary so much as I have in the 1/2 B. Don't the spelling challanged have rights too? Bahr-Beh-Queue? a.k.a Propane Powered Eyebrow Removal Tool.